The first ‘John Wick’ was a really fun, kinetic action movie that played to its strengths and delivered a very enjoyable movie that told a slick story from beginning to end within its 100 minute runtime. Based on its success, we find ourselves with ‘John Wick: Chapter 2’, and perhaps it’s biggest failing is that it feels like a two hour long preview for a further sequel, as opposed to focusing on telling its own story. It’s a disjointed movie, not without its pleasures, but ultimately it’s a classic example of a sequel that goes bigger, bloodier and longer, without considering what made the first film so popular in the first place. It does start really well, with an energetic pre-credits sequence that showcases the skill for directing action scenes that Chad Stahelski has (directing on his own after a joint credit on the first film) as Wick closes off a loose end from the first film. It’s got the zip and the thrill in the fight scenes, and in a small part for Peter Stormare, the dry wit that punctuated much of the first film to good success. After that, things do start to fall down somewhat. The film is undoubtedly too long and could have done with some serious editing, and the narrative doesn’t have the same kick as the original did. Its strengths are in the action set pieces which are just as gleefully absurd, but the villains aren’t as memorable, nor are the moments in between the action as fun. The lengthy running time allows for a lot more exposition, but it prevents the film from maintaining a rapid fire pace, and this is not the kind of film that wants to allow its audience the time to stop and think. ‘John Wick’ built up an interesting world, with the assassin’s inner circle and the Continental Hotel pretty cool with just the right amount of quirkiness, but many of these elements are expanded on poorly and what worked in small doses in the original, works less well in this outing. 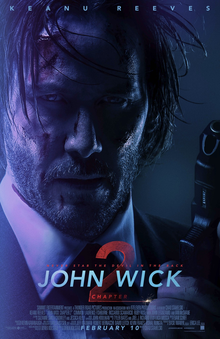 Keanu Reeves continues to be well cast for the part and his ability in the action sequences really shines through, but beyond the action scenes, ‘John Wick: Chapter 2’ is a disappointment and I can’t say the thought of further sequels fills me with any excitement.